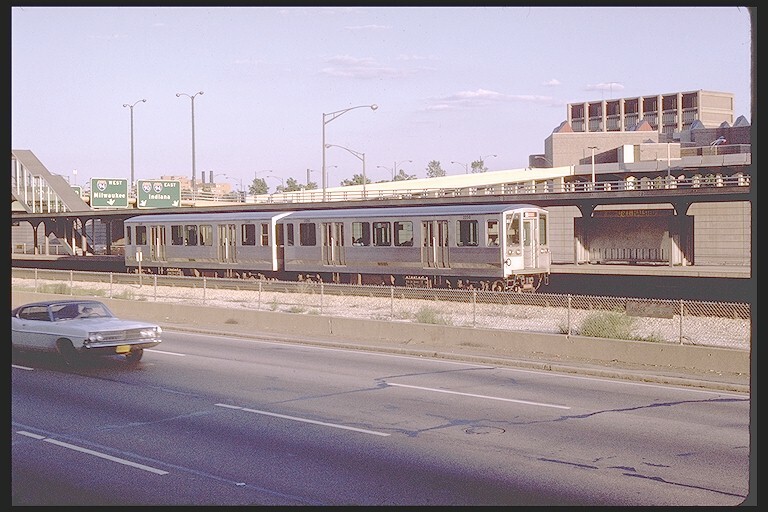 The original Halsted station of the Metropolitan West Side "L" was just north of the westbound lane of the Eisenhower Expressway, at the top of the slopping berm down to the depressed highway. Built as part of the Met's main line in 1895, this station and the rest of the main line and Garfield Park branch were demolished in the mid-1950s when the Congress Street Expressway was constructed. The plan included a novel concept: a rapid transit line in the median of an expressway, making a sort of transit corridor. 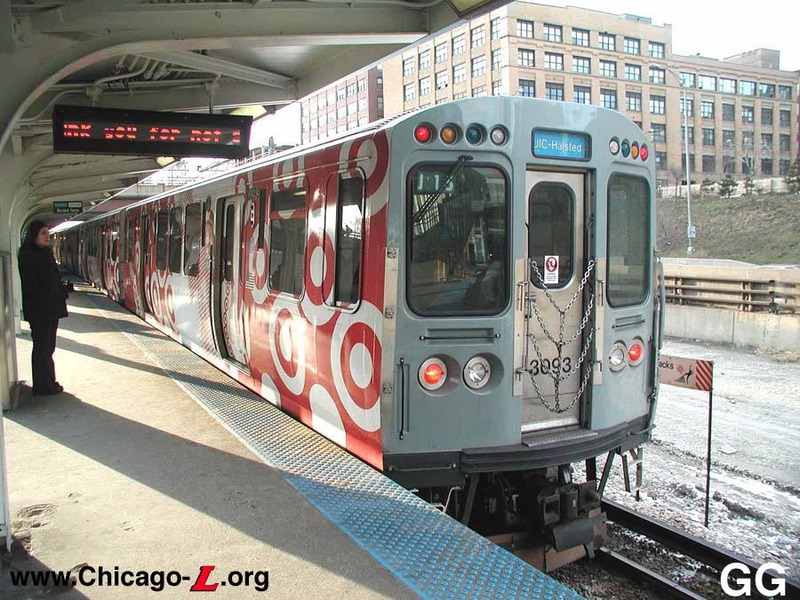 The "new" Congress Line thus provided no net mileage gain for the "L" system, though the facility would be newer and capable of providing faster service. 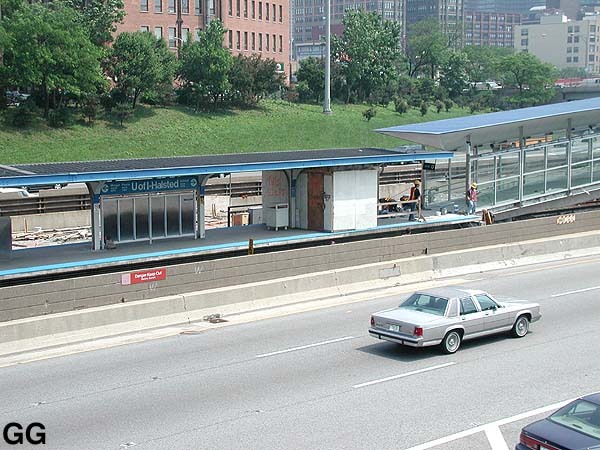 Station design here is somewhat unique, resulting from a compromise between the historic concept of closely spaced stations (favored by aldermen) and widely spaced stations, coordinated with bus feeder routes (preferred by eager CTA planners anxious to improve transit service and system productivity). The fare collection building is about 42 ft x 21 ft. The more important stops are located between two cross bridges separated by about 1/4 mile and there is a station house and access ramp at each end. While there are obvious disadvantages to the long ramp concept, the compromise design did avoid the additional stops the CTA planners hoped to get rid of. The new station served the Chicago campus of the University of Illinois. The Circle Campus (as it was originally known) opened in February 1965, so the station was renamed from "Halsted" to "U of I-Halsted" to reflect this new landmark. The significant portion of the station's traffic was anticipated to come from the university, so a third entrance was added at an intermediate street more convenient for the school, Peoria Street. As part of the design of the new campus, the Peoria Street bridge was closed to auto traffic and became pedestrian access, connecting to the campus' elevated concrete and granite walkway system at the south end of the Peoria bridge. (The campus' elevated walkway system was removed in the mid-1990s.) The new Peoria station entrance, considerably larger than the other two station houses, was built on the Peoria Street overpass. The station house's east half had a masonry exterior with an aluminium and glass storefront and flat roof and eave that extended over the entrance doors, while the west half was a steel-frame glass-enclosed building with an arched roof. It contained a large space in the paid area for concessionaires, and had both stair and escalator access from the station to the platform. An auxiliary exit stair was provided from the platform to the east side of the overpass, opposite the station house entrance. The Peoria entrance opened on February 22, 1965 and the station's name changed on the same day. In the following decades, many Congress Line stations saw their auxiliary entrances closed or scaled back. 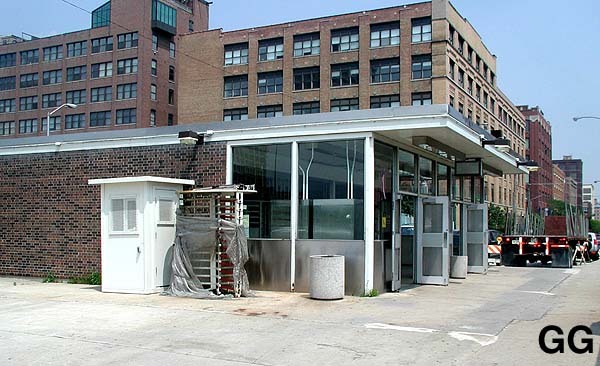 Halsted's Morgan entrance escaped many of these service cuts, but its time ran out on September 20, 1981, when it was closed amid another round of Congress Line auxiliary entrance closures. The entrance was later reopened, though at what date is uncertain; this most likely occurred in the late 1980s/early 1990s. The Peoria entrance, which drew heavy traffic from the university, was still only a part-time entrance, closing at night and not reopening until 1025 hours daily. On October 16, 1995, a six-month test began under which Peoria's opening time was moved back to 0630 hours. The test was successful and Peoria maintained earlier opening hours. 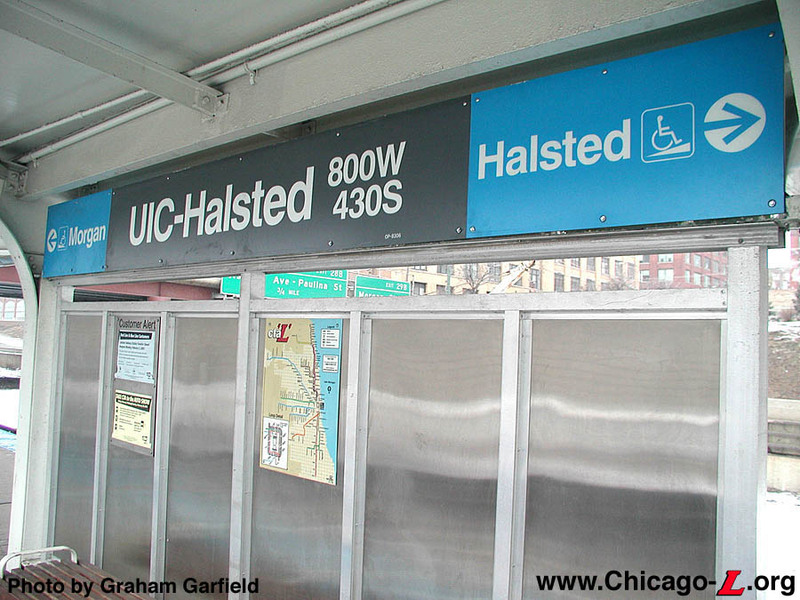 Also by this time, the station's name was slightly altered from "U of I-Halsted" to "UIC-Halsted" to reflect the campus's revised name, although none of the signage was changed to reflect this for several years. The "UIC-Halsted" name first appeared in maps in 1993, although it was not consistently referred to as this until the mid-1990s. 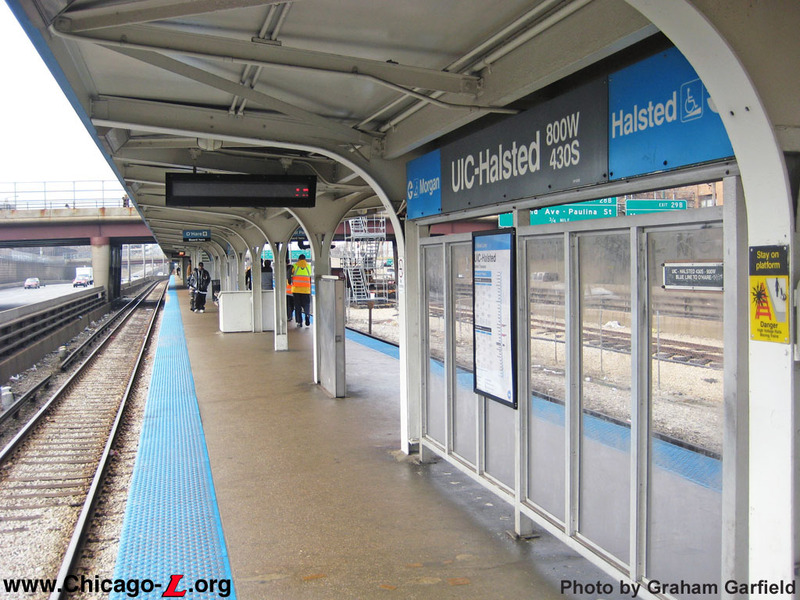 In December 2000, UIC-Halsted was adopted under the CTA's Adopt-a-Station program. Greek artist Eleni Glinou was commissioned to design scenes from the mythical poem "Ithica" by Constantine P. Cavafy. The six colorful murals adorn the UIC-Halsted station, which sits on the south boundary of Greektown. The murals were painted by Gallery 37 student artists. 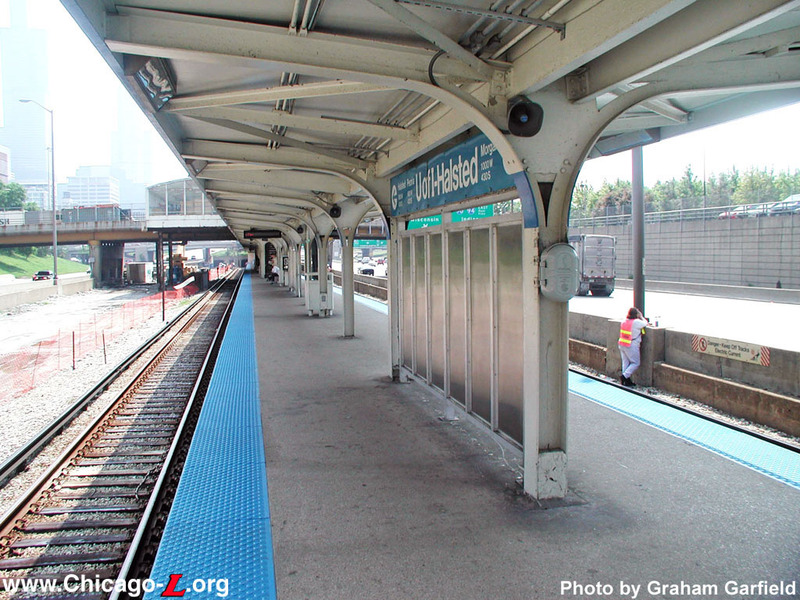 UIC-Halsted was one of 21 stations included in a capital improvement program designed to bring a series of improvements to rail stations mainly along the Red and Blue lines, leading to the internal colloquial name "Red/Blue project". The improvements were intended to extend the useful life of the existing facilities, make them more attractive to customers and more convenient for people with disabilities. Some of these changes were very visible to rail customers, while others were behind-the-scenes improvements. Among the most significant improvements made as part of the contract were upgrades to make 11 rail stations compliant with the Americans With Disabilities Act. (ADA), including UIC-Halsted. 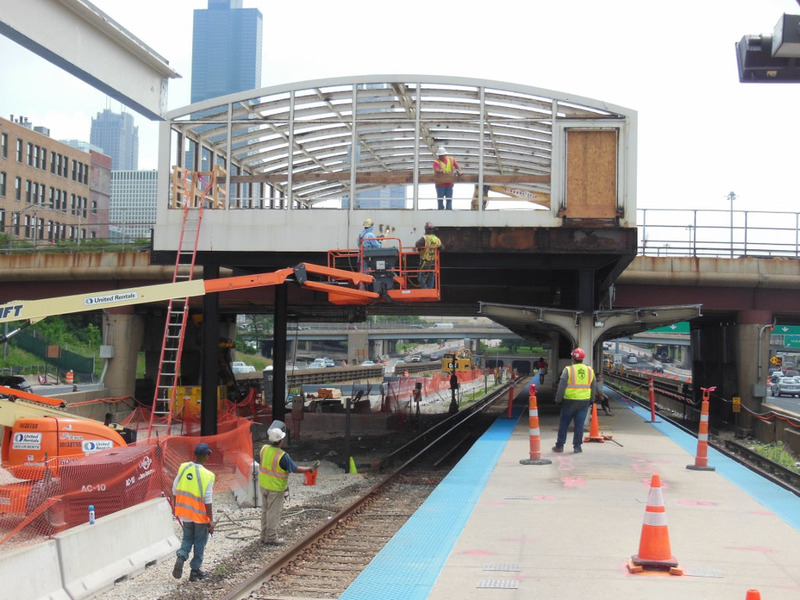 The $60.4 million station improvement project was competitively bid and the Walsh Construction Company of Chicago was the lowest responsive and responsible bidder. 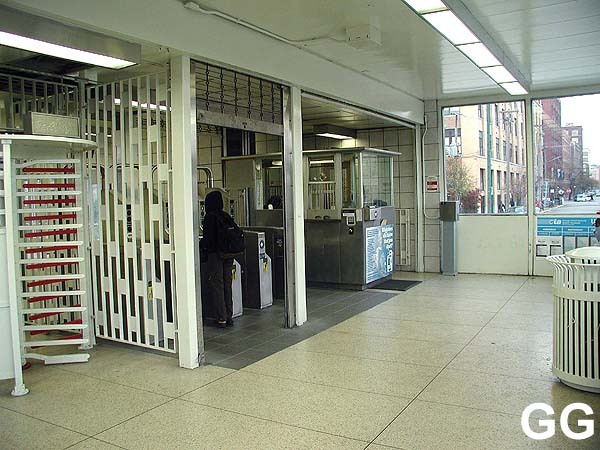 The Morgan entrance to the station closed on April 17, 2000 as the first phase of an extensive project that resulted in making UIC-Halsted accessible to persons with disabilities at both the Halsted (800 W) and Morgan (1000 W) entrances. The previously-exit-only facility at Morgan Street was closed for about five months while the station house was modified. 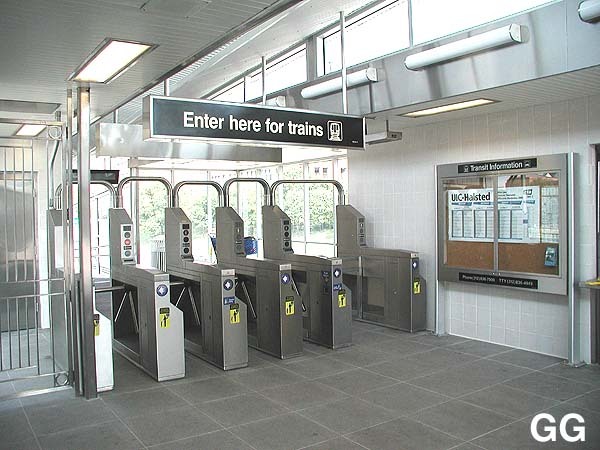 The reconstructed Morgan entrance has two new standard turnstiles and a turnstile for access by customers with disabilities, as well as a ramp to the platform that has been reconfigured to meet ADA guidelines. The entrance was to be staffed 24 hours daily. It also received a new floor installed, along with some new wall tiling, new signage, new fare controls, and a new agents booth, which extends thought the front of the station house and alters the appearance of the front facade. It was given a more modern look, executed in stainless steel. Morgan also received two TCVM farecard vending machines. 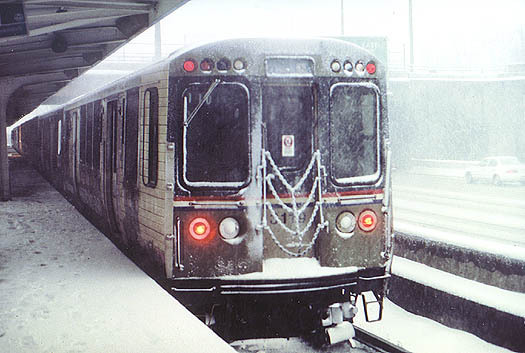 The Morgan entrance to UIC-Halsted reopened at 0600 hours on September 24, 2000. At the Peoria entrance, the stairways from the street level to the platform were rebuilt to provide wider clearance on the platform for customers in wheelchairs. At least one stairway was kept open at all times while the work proceeded. When the reconstruction was completed, the escalator was removed and two stairways were provided for customers to enter and exit, with a third for exiting only across from the station house. Construction of a new stairway began at the Peoria entrance on Monday April 2, 2001. The escalator at the Peoria entrance was permanently closed at that time. Work at the Peoria entrance was finished in Fall 2001. 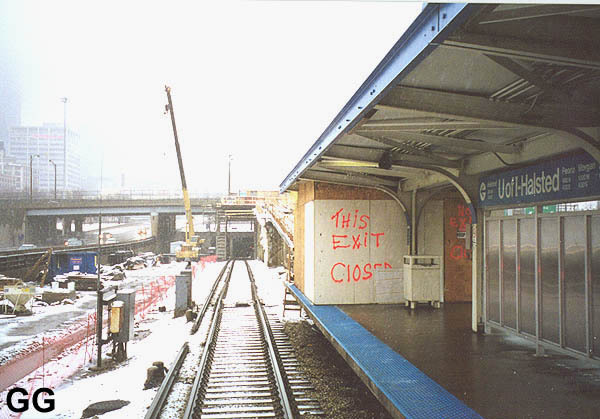 The next phase of construction at the UIC-Halsted station was undertaken in Fall 2000. With construction at Morgan completed, the work shifted to the main station entrance at Halsted, which will be closed for about four months. 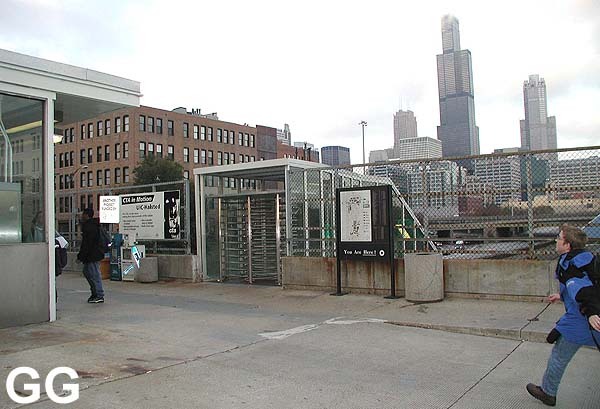 Starting at 9:30am, Monday, October 30, 2000 the UIC-Halsted station entrance at Halsted was closed for reconstruction to provide accessible features similar to those available at the westernmost entrance to the station at Morgan. 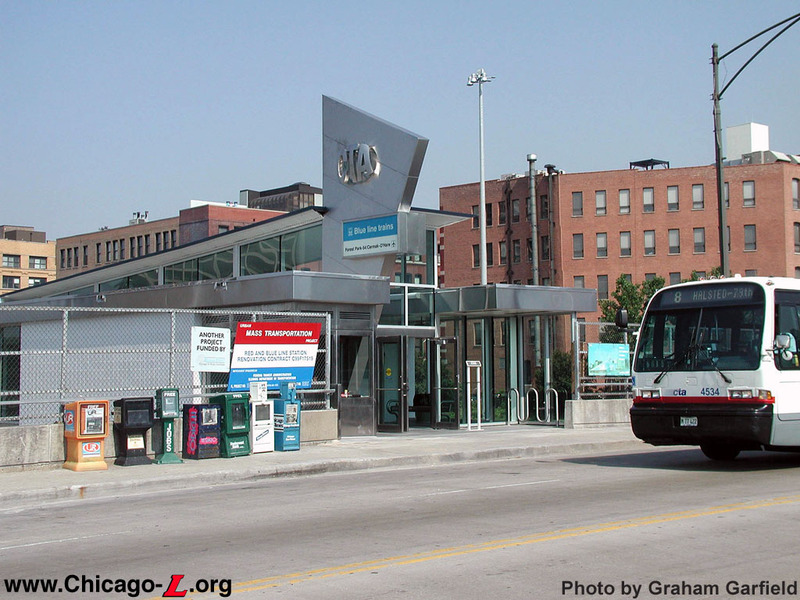 While the Halsted entrance was closed, customers had to use the entrance at Peoria to connect to #8 Halsted buses on Halsted at either Harrison or Van Buren. #7 Harrison buses were boarded on Harrison at either Peoria or Morgan. During this time, the street-level Halsted station entrance was demolished to be rebuilt for accessibility. By April 2001, new micropiles were installed under the Halsted station. Construction of the new ADA-complaint pedestrian ramp and station house slab had been completed. 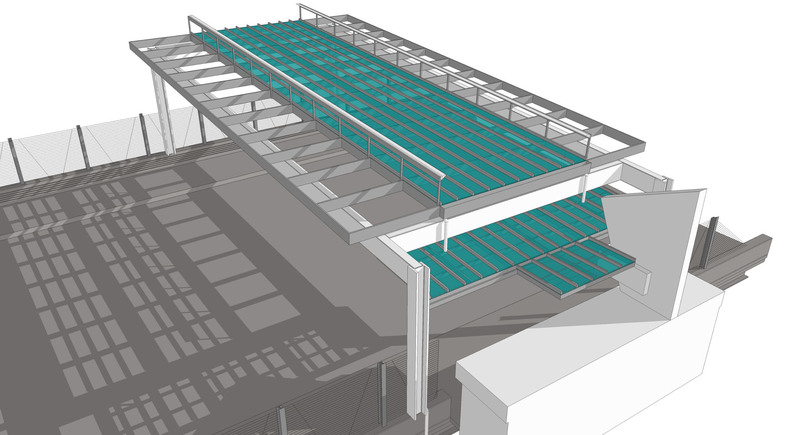 The canopied roof system for the new station house had been completed and assembly of the new station house and completion of the new ramp was proceeding. Effective at 0530 hours on June 26, 2001, the new Halsted station house at the UIC-Halsted station reopened after the extensive rebuilding project. 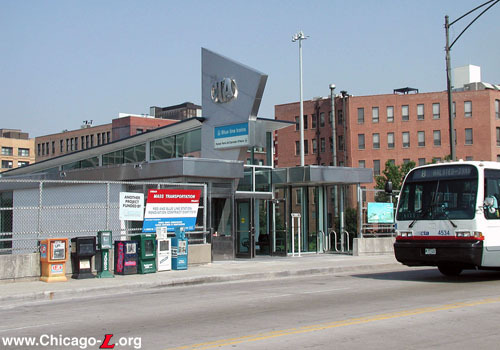 The Halsted entrance to UIC-Halsted station was now accessible to customers with disabilities and includes a new station house (in a postmodern design), a new audio/visual pubic address system, a new accessible ramp, improved, brighter lighting, new fare controls and CA booth, a new concession, and new granite flooring. 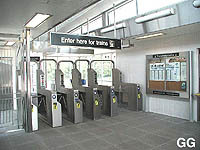 The Halsted entrance had three standard turnstiles and an accessible turnstile for customers with disabilities. 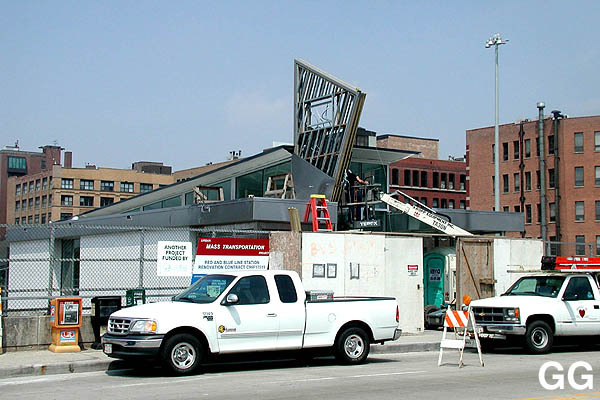 Work at the Peoria entrance to UIC-Halsted began on Monday April 2, 2001 when the escalator at the Peoria entrance was permanently closed and construction of a new stairway was undertaken. 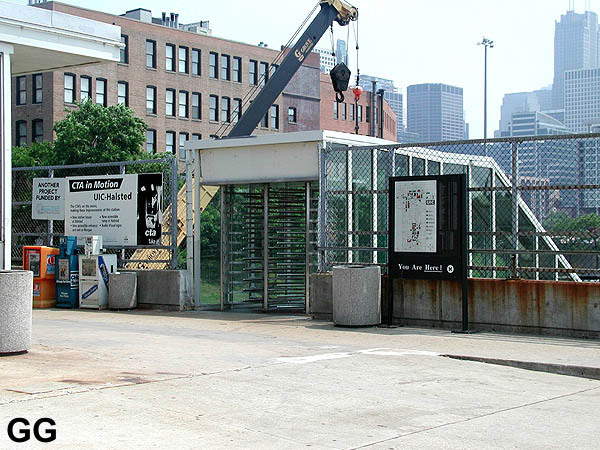 In early summer, the auxiliary exit stairway on the east side of the bridge was rebuilt to be converted to a farecard-only entrance. 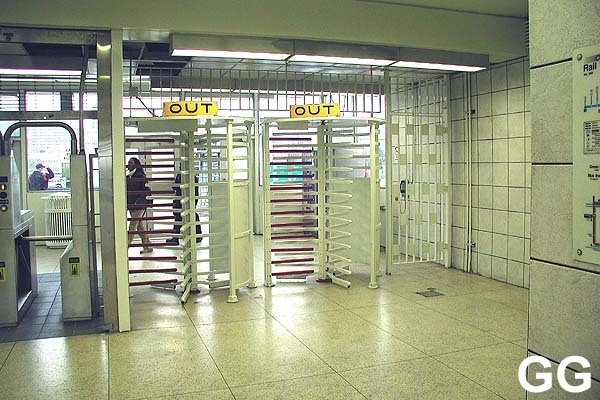 On July 2, 2001, this was converted to an auxiliary entrance, with access through high-barrier gates with farecards only. On the same day, the Peoria station house closed for final rehabilitation work. 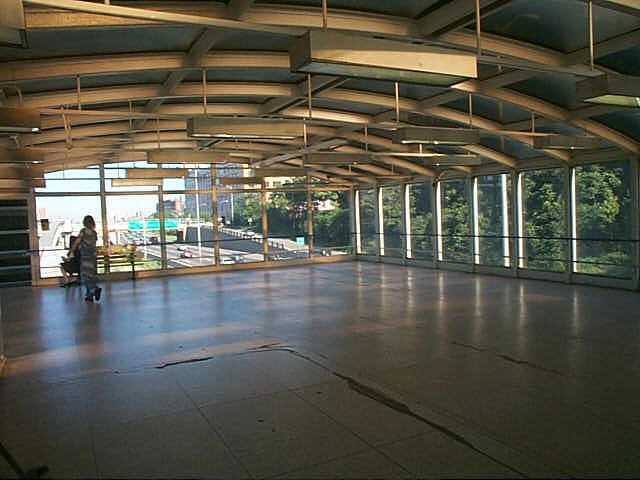 On Saturday, October 20, 2001 at 0700 hours, the Peoria station reopened for passenger use. The "middle stairway" (as the CTA called it; the east stairway within the station house) reopened, while the "east stairway" (the auxiliary stairs outside the station house) closed temporarily to have the HBG turnstiles removed and replaced with exit-only rotogates. On Monday, October 22 at 0603 hours, the east stairway reopened for exit only with new rotogates installed. The middle stairway from inside the Peoria station house must now be used to access the platform from Peoria Street; both the middle and east stairs can be used for exit. The "west stairs" from inside the station house remained closed while final work, including the instillation of hand rails and glass panels in the stair enclosure, in completed. The renovation of the Peoria station house included new flooring, repainted walls and ceilings, new gray wall tiling, new lighting, new A/V signs and new communications equipment. The same 1965-vintage CA booth and exit rotogates (complete with original 1965 black-and-yellow "Out" signs!) were left in the station house. The stairways from the street level to the platform were rebuilt to provide wider clearance on the platform for customers in wheelchairs. With the reconstruction nearly completed, the original escalator has been removed and the two stairways inside the station will be available for customers to enter and exit, with the third across from the station available for exiting only. The Peoria station house was one of the few "L" station head houses that was still used by some passengers as a waiting room (the Randolph/Wabash Inner Loop station house was chiefly the other). The clear walls and functional "annunciators" (those backlit signs that say "From Loop" and "To Loop" that flash and sound a bell to alert passengers to approaching trains) allowed passengers to stand inside the station house, away from inclement weather, and either see or be alerted to approaching trains with enough time to go down to the platform before their arrival. There were no seats or benches in the large paid area of the Peoria station house, however, to facilitate waiting there. The west stairs from the Peoria entrance reopened Monday, November 12, 2001, making both station-to-platform stairways from inside the Peoria headhouse in service. At the same time, however, the east auxiliary exit stairs closed temporarily for a final repainting. They reopened soon after, thus substantially completing the UIC-Halsted renovation project. 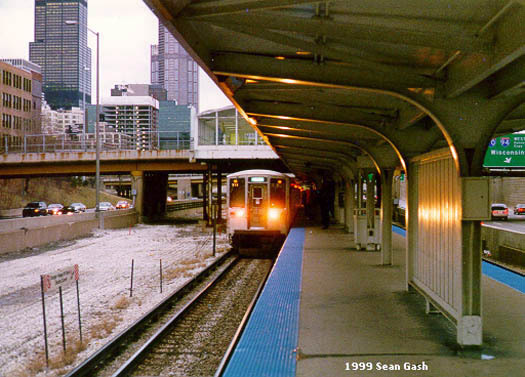 All work at the UIC-Halsted station complex was complete by November 2001. 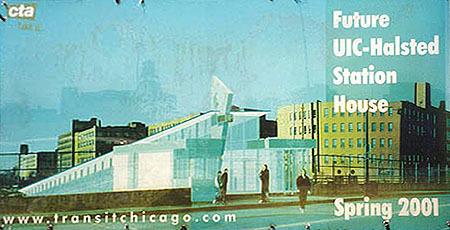 New station name signs, following the Green Line Graphic Standard, were installed at four Blue Line stations in late 2002/early 2003, including UIC-Halsted. Over the weekend of February 22-23, 2003, crews replaced the KDR station name signs with new Green Line Graphic Standard models, in the same locations over the windbreaks. The new signs corrected one aspect that was out of date on the old signs: the station name. 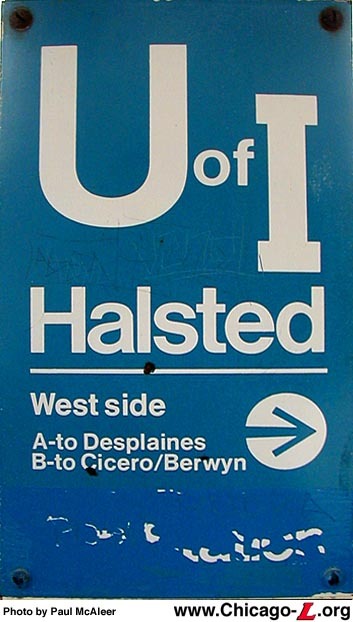 The KDR signs called the station by the previous but similar name "U of I-Halsted", with the typeface "I" being a block-I like the University of Illinois logo rather than being Helvetica, as the rest of the CTA's signs (and the other letters on the U of I-Halsted sign) were. The new signs call the station "UIC-Halsted", reflecting both the university's name change and the name the station has gone by since the early 1990s. With this step forward, however, came a small step backward: the omission of one of the exits on the tabs. The KDR signs that were replaced listed all three entrances/exits: Halsted, Peoria, and Morgan. The new signs listed only Halsted and Morgan, but did not indicate which direction the center exit at Peoria can be found. Plans called for additional station name signs to be installed outside the tracks on new posts, but this has not been undertaken to date. 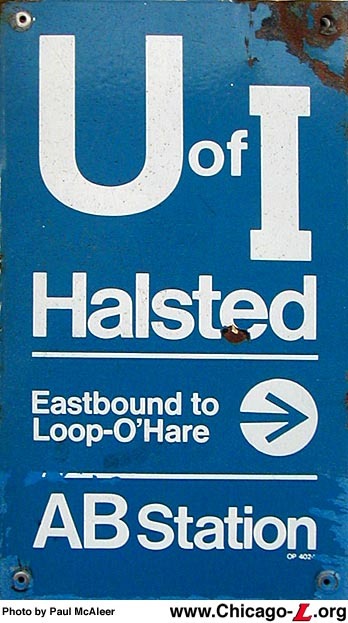 Existing symbol signs (which still call the station "U of I-Halsted" and use the block-I) were left in place during this effort, but were finally replaced with Green Line Graphic Standard versions with the updated station name in 2008. 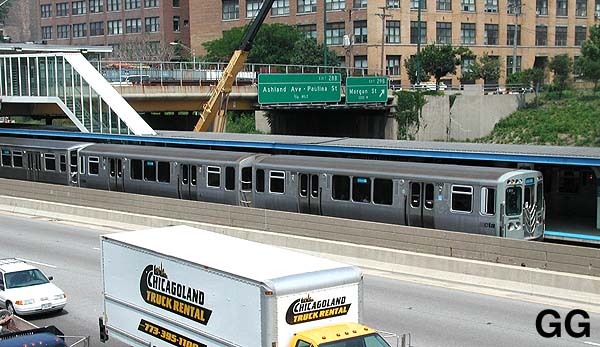 As part of the Illinois Department of Transportation's $420 million Circle Interchange Project, to rebuild the namesake "spaghetti bowl" interchange where the Dan Ryan, Kennedy and Eisenhower expressways converge west of downtown Chicago, the adjacent UIC-Halsted station saw several improvements and other effects. 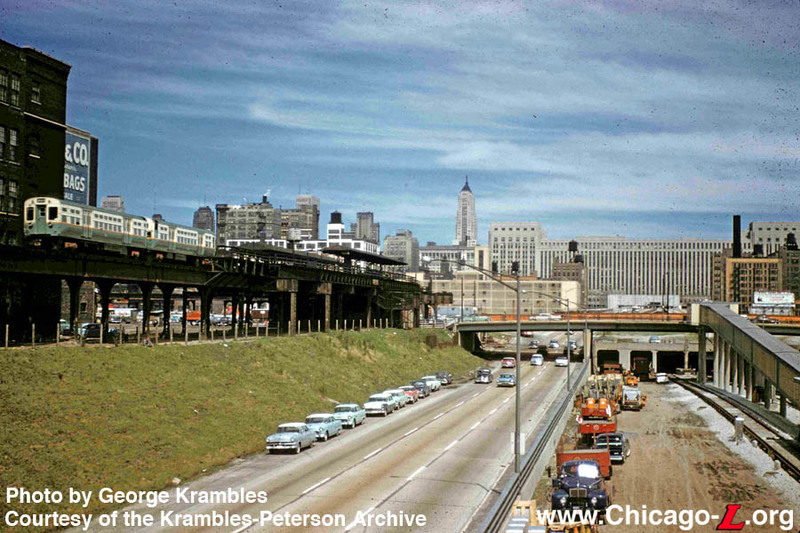 To accommodate the new interchange ramps, the bridges over the Eisenhower Expressway for Halsted, Peoria (actually, the pedestrian walkway aligned with Peoria) and Morgan streets had to be rebuilt, affecting access to the station entrances located on each of those bridges. 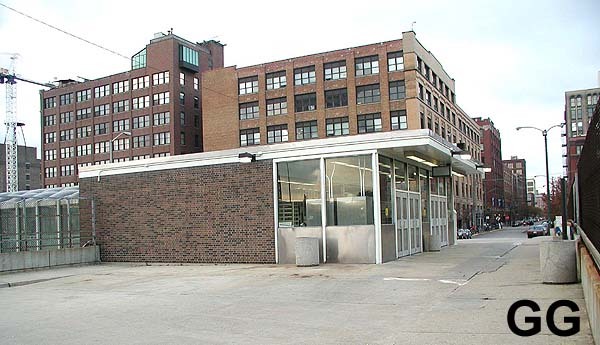 In addition, the project included $16 million of improvements to the UIC-Halsted station to offset the roadway investments, as well as other features to improve the area. The Morgan entrance to UIC-Halsted closed from September 23, 2013 through June 9, 2014, while IDOT's contractor rebuilt the Morgan Street Bridge. When the station entrance reopened the bridge was still not complete, but had advanced enough to provide a walkway to the station house. However, the entrance was temporarily not ADA-accessible while bridge work continued. 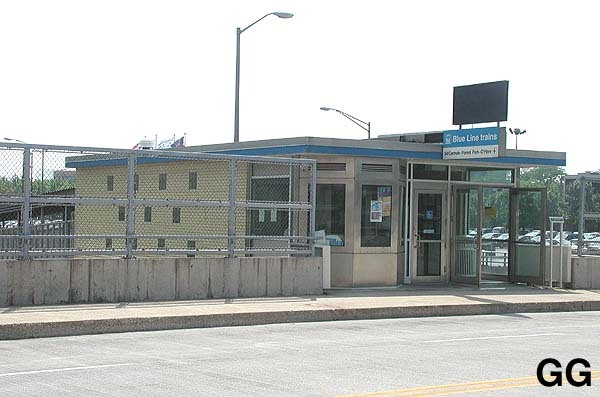 The bridge reopened to auto traffic on October 6, 2014, at which point the sidewalks leading to the station entrance were finished and again provided ADA-compliant access to the Morgan entrance. 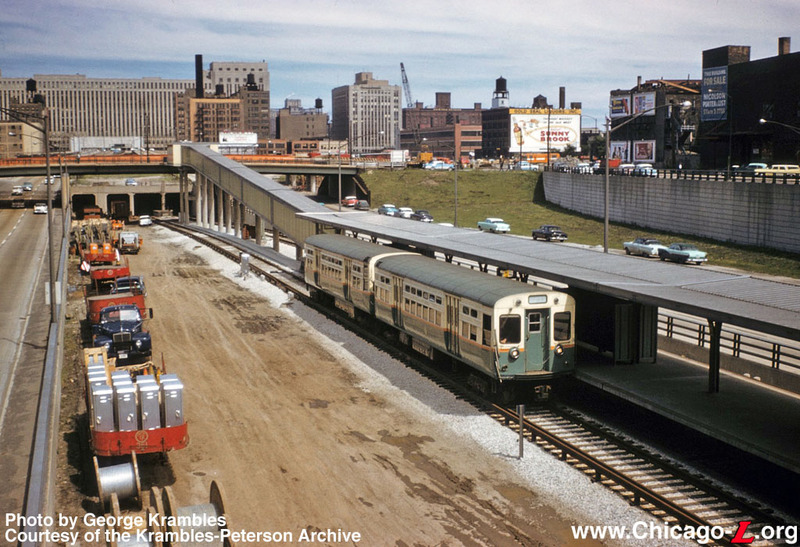 The work at Peoria also included improvements to the 1965-built CTA facility and surrounding area. 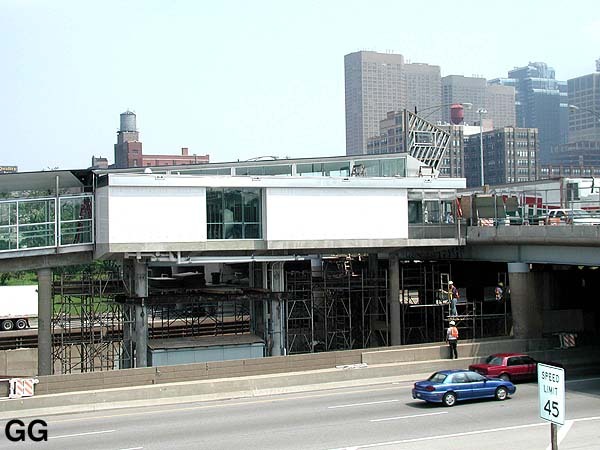 The existing CTA station house's east half, a masonry structure located on the bridge, was removed as part of the project. The west half of the building, a steel-frame glass-enclosed building with an arched roof, was rehabilitated and improved. 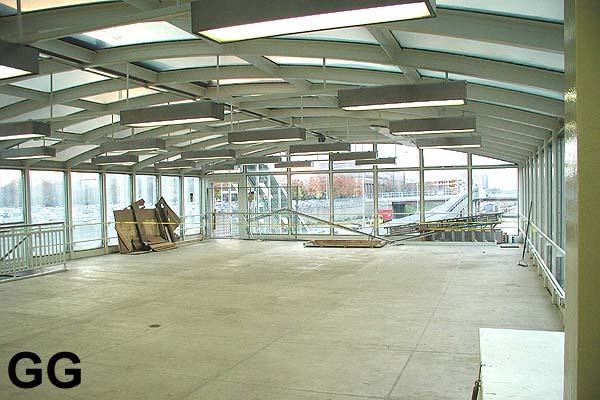 The renovation included the installation of a new elevator, adding a third accessible entrance to the already ramp-accessible Halsted and Morgan entrances; roof replacement; new exterior panels; replacement lighting; installation of new security cameras; and relocating the customer assistant kiosk and turnstiles into the glass building. The Peoria Street project also included associated work along the Peoria Street corridor from Harrison to Van Buren to make it a pedestrian/bicyclist only facility, including landscaping, lighting, wayfinding signage, and other features. The construction contract for the Peoria work was awarded to Kiewit Infrastructure Co. on March 31, 2014. The Peoria station entrance closed at 4am, Monday, June 9, 2014 -- concurrent with the Morgan reopening -- to allow work on the bridge to commence. 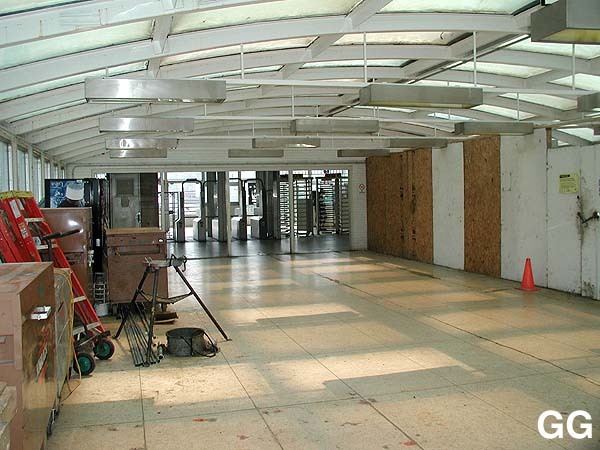 By early July 2014, the Peoria station house had been stripped down to its structural shell, and the platform canopy below had been cut in two with a section in the removed to accommodate the new elevator. IDOT had to revise completion dates for some of the work because of delays in working with utility companies, which affected both Morgan Street and Peoria Street construction.1 The UIC-Halsted station Peoria entrance reopened at 5am, Monday, August 31, 2015. While largely complete at the tine, renovation work continued on the station house area, including the new elevator, into Autumn. The elevator at Peoria was not brought into service until Tuesday, May 24, 2016. 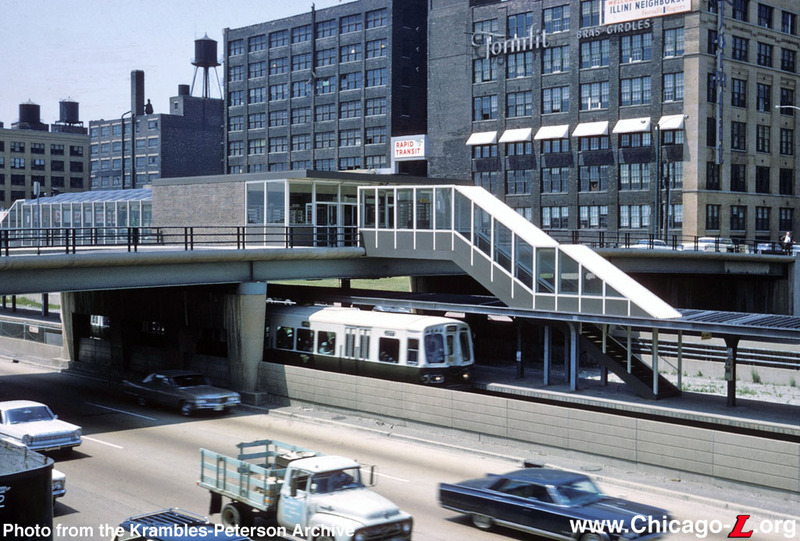 At that time, all three entrances to the UIC-Halsted station were ADA-accessible -- two by ramp, and one by elevator. Improvements at Halsted Street included a new mid-block crosswalk at the CTA station entrance, allowing passengers transferring between the Blue Line and northbound #8 bus a more convenient way to cross busy Halsted Street. The signalized crosswalk would be covered by a new overhead canopy, and the northbound bus stop will be relocated adjacent to the crosswalk. The construction contract for this work was awarded to Walsh Construction on December 10, 2013. The old Halsted Street bridge was torn down in March 2014, having outlived its usefulness according to IDOT. The bridge also needed to be widened to accommodate the soon-to-be expanded Eisenhower Expressway as part of the interchange work. The bridge was demolished and rebuilt half at a time, with traffic confined to either the east or the west half in each phase. 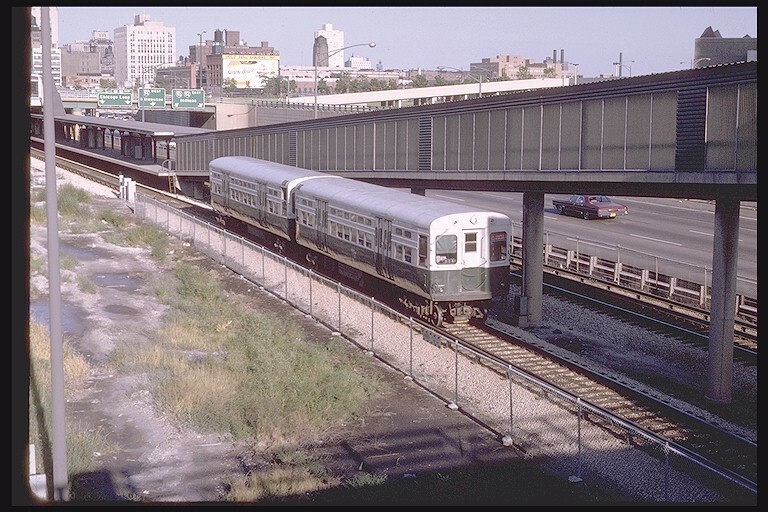 Access to the CTA station entrance was generally maintained in each phase, even using a temporary enclosed bridge to span the removed east half of the bridge while it was under reconstruction, though some short-term closures over weekends or a few days did occur. State and city officials announced Friday, July 22, 2016 that work had been completed on the Halsted bridge. Though the bridge has been open for about two months at that point, it was in July that crews finalized the canopy over new mid-block crosswalk to provide pedestrians cover walking between the Halsted Street Blue Line station house and the east sidewalk. A stoplight was installed on the canopy to help protect pedestrians crossing the street. The northbound #8 Halsted stop was relocated to the mid-block crosswalk, across from the station entrance, concurrent with the completion of the bridge work and canopy. 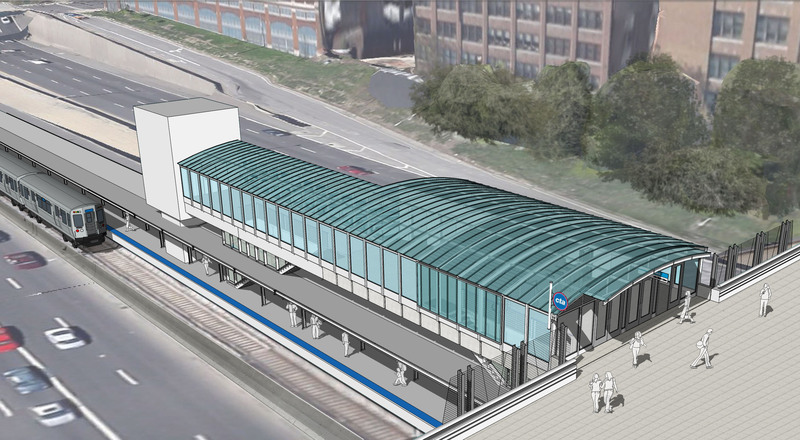 Artist's rendering of the new Halsted station house at UIC-Halsted. This drawing was posted outside Halsted for the duration of construction. UofI-halsted.wav (31K): Station announcement for U of I-Halsted. 1. Swartz, Tracy. 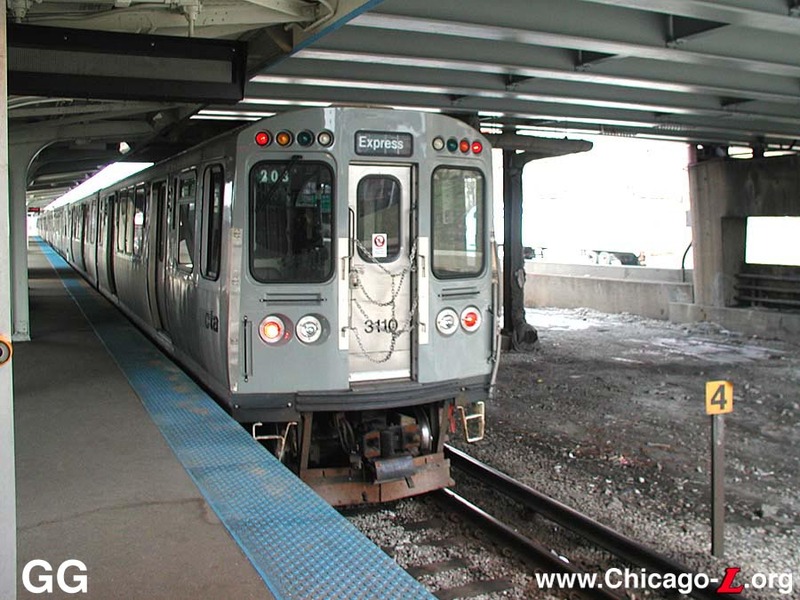 "CTA UIC-Halsted stop renovations to be done in May: IDOT". Red Eye. October 21, 2014.